The final stage of the ‘Gladiator’ corridor at Rowlatts Hill, a grass carpet has now been laid to bring the project to a conclusion. It is the final piece of the jigsaw, the cherry on the Bakewell tart, the penalty save in added-on time. The before and after pics show a significant transformation. Well done Matt Hassall, and thank you. You’re an absolute star. It really looks terrific! The third and final part of the ‘Gladiator’ project was to be painted on the floor. Physically, painting large walls is always a challenge. Painting ceilings is even more onerous, there is no escape from the strain on neck, back and shoulders. A floor however is probably the most demanding. Back, neck, knees, calf muscles and hamstrings complain after long sessions of bending and crouching in an almost fetal position. Wrist and elbow feel the pressure too from reaching and supporting one’s weight. Even with the use of kneeling pads for protection, there’s no respite at all. Having said that, unlike the two previous occasions when I have painted a ‘fl-ural’, a ‘Volcanic corridor’ at Fulbridge Academy and a ‘Rabbit Hole’ at Titchmarsh School, this at least would be on a much smaller scale. The area to be covered measured only 1150 x 1170mm, nevertheless I use the word ‘only’ reservedly, I knew from experience that even this would not be a short undertaking, nor would it be an easy one. If the painting proved successful though, it would not only be the icing on the ‘Pudding Club’ cake for the ‘Gladiator’ project, it would be the cherry on top too. I began to develop design ideas by researching Roman floor mosaic motifs, and while engaged in this task an article about an archaeological discovery in the centre of Leicester appeared on the BBC news page. I incorporated features seen in the photographs from both this reference and from the University of Leicester Archaeological Services website and employed a similar but brighter palette in order to make a connection. I retained its simplicity by restricting the design to four colours, with two blue tones, a red, an orange (rather than the brown/grey of the original) and white. On showing my design to Principal Jay Virk it was given an immediate and enthusiastic thumbs up. I prepared actual size artwork to assist the transfer of design to floor, and pencil crayon drawing soon evolved into a fully fledged ‘fl-ural’. The painted ‘mosaic’ acts as a very effective final statement to the ‘Gladiator’ project, and symbolically like a full stop at the end of the last sentence of an immensely enjoyable novel. Following the application of four coats of varnish this brought my residency at Rowlatts Hill Academy to a conclusion. A quote painted on the wall at the end of this corridor has been staring at me for the last couple of months. It reads, ‘Don’t stop until you are proud’. It’s always difficult to assess a painting while working in such close proximity with it, but I’ve reached a point where I’m feeling pride about this one, so I’ve stopped. Last September I had made a promise to complete three projects at the school, and which I had estimated would require approximately 12-15 weeks to fulfill. However, due to the unforeseen circumstances outlined in my ‘Pure Imagination’ blog, instead of three months my stay had come close to being nine. Working at Rowlatts Hill has been an absolute pleasure and I thank everyone for being so supportive and understanding about my personal situation. I could easily make a long list of all the teaching and support staff I’d like to thank, I have been made extraordinarily welcome and enjoyed some very good company. In particular I am indebted to Jay and Grant, Principal and Business Manager at Rowlatts Hill. We began with a working relationship, we now enjoy a meaningful friendship. In addition similar feelings apply to Site Premises ‘Captains’ Matt and Nathan too. The assistance and support I’ve received from both has been invaluable, their good humour consistently uplifting and, to say the least, incomparable. I’m really going to miss you chaps. Thank you Rowlatts Hill. To paraphrase the opening line of Charles Dickens‘ ‘A Tale of Two Cities’, what has been the most difficult of times has also been the best of times. Hard on the heels of the ‘Once Upon A Time’ mural, my brief for this follow-on project was to transform the appearance of a fairly narrow and very busy corridor and create a taste of Tuscany, a landscape filled with grapevines and warm sunshine. This space, located outside two Year 3 classrooms, leads to a Roman themed area of the school and Principal Jay Virk suggested the final scene from Ridley Scott‘s ‘Gladiator’ movie as a clue of what she envisaged in her mind’s eye. Remembering his home built at the end of an avenue of cypress trees Maximus, Russell Crowe, imagined himself walking through a wheat field in a gently undulating Tuscan hillside to return to his family. To him, this was an image of Heaven. However, the ‘Gladiator’ mural would be painted in three parts, and as this would be the largest I decided to begin with the smallest section first, so Heaven would have to wait till ‘Part 1’ was completed. The wall seen at the end of the corridor was located within a cloakroom area already having the appearance of a Roman villa, which posed a problem. The design had to work both as an integral element of an exterior landscape scene as well as a Roman interior. The difficulty was resolved by giving the impression the wall surface was made of marble with a plaque, inscribed with a portrait of a Caesar, mounted on it. The trompe l’oeil plaque and portrait was inspired by a Roman coin auctioned in Switzerland in 2015. The corridor walls have an imagined landscape view and at its end, before entering the Roman area, a grapevine covered pergola helps disguise a door frame. This portion of the corridor is quite dim, so the pergola generates the illusion of being the cause of the shade, whether walking in one direction and out of the ‘sunshine’ or from the other on leaving a bright ‘interior’. Looking back, the landscape on the wall above the stairs was based upon the house seen in the previously mentioned final scene of the ‘Gladiator’ film, the perspective of the avenue of cypress trees painted to work with the angles seen as one walks toward it. The walls on each side of the steps are painted in a fragmented, abstracted manner as the landscape gradually simplifies and metamorphoses either into a portrait of the Queen or a stained glass window, the final elements of the ‘Casablanca‘ and ‘Give Peace a Chance‘ murals which are located in the adjoining corridor. In time, the surface of the corridor floor will be covered with a grass carpet which will further assist with the illusion of walking through an avenue of vines, and the small area of floor between pergola and portrait will become the final section of the Gladiator mural. This will be Part 3 of the project, to be painted next, and which will involve the painting of a mosaic. Yesterday Warmington, today Titchmarsh. The location may have changed but the activity was identical, and I presented the same introduction and drawing exercises. Not exactly a Groundhog Day, but I definitely recognised some similarities. Therefore, rather make a similar entry here, I would suggest a perusal of yesterday’s ‘Funny Face’ blog for an outline of the activity which was presented to children again today. Outcomes had a familiar ring too. The Yr 3&4 group and the Yr 1&2 group produced some very successful drawings, both with the introductory exercise of a disciplined and well proportioned portrait as well as with the more expressive and exaggerated representation requested for illustrations of the cast of characters from ‘The BFG’ book. I now have the very difficult job of making a selection from the drawings produced during the last two days in order to design a composition for the painting of a mural in the Titchmarsh School library. With so many good drawings to choose from, I know that making a shortlist is not going to be an easy task at all. I thought Gnarls Barkley was the perfect choice to add to my Blog Title Soundtracks page. The title is not only a perfect description of many of the portraits the children have produced today but also of the Titchmarsh Primary School welcome I’ve received too! A different musical choice to add to my Blog Title Soundtracks page, but perhaps not a surprise to anyone who knows me either. I’ve always admired Fred Astaire, he was a class act. The song title selection however couldn’t be more appropriate. It’s been another day of drawing workshops at Warmington School leading a group of year 3&4 children this morning, followed by a group from years 1&2 this afternoon, and once again some very successful pieces of work have been produced. Both groups definitely had their listening ears on. I began each session with a short talk as an introduction to portrait painting and they appeared to enjoy the images presented to them of work by Leonardo Da Vinci, Rembrandt, Graham Sutherland and William Dobell before moving into the arena of caricature, discussing works by Honoré Daumier, Max Beerbohm, Gerald Scarfe, Marco Calcinaro, Sebastian Krüger and Patrick Strogulski. Feeling suitably inspired, we then settled down to some practical work. The first exercise was to produce a portrait drawing, loosely based upon a measurement system devised by Da Vinci, to analyse the proportions of the human head. Using pencil on an A4 sheet of paper this was a very disciplined exercise which demanded a high level of concentration as drawings were constructed upon a carefully drawn grid. However this was simply the appetiser for the main course as the next drawing was about to prove. As a complete contrast to the preliminary exercise, the emphasis now was to allow distortion of features to become a priority in order to produce an illustration of a character from a book by Roald Dahl. First I read some passages from ‘The BFG’ which described the main cast members; Sophie – a young girl who is “kidsnatched” from her bedroom at the orphanage where she lives; The BFG himself – a kind, gentle giant who can be found every night blowing good dreams through the bedroom windows of sleeping children; and the nine scary giants in Giant Country who are about twice as tall and wide as the BFG, and a lot more horrible – The Bonecruncher, The Fleshlumpeater, The Bloodbottler, The Childchewer, The Meatdripper, The Gizzardgulper, The Maidmasher, The Manhugger and The Butcher Boy. Chalk pastel was used for this exercise and my intention is now to select the most successful drawings and incorporate them into a mural which will be painted in the library at Titchmarsh School later in the week. As can be seen from the examples below, I have several very worthy contenders to choose from………..
Shiver me timbers! It was back to the good ship ‘Fulbridge Academy’ this morning to lead the second of two portrait themed workshops. However the approach today had a distinct contrast with the previous session. To begin with the day had a Pirate theme and according to pirate name generator site http://pirate.namegeneratorfun.com/, my name for the day was Toby ‘Throat Slasher’ Raw, “The Keelhauler of Cutlass Haven!”. Well I’ll be the son of a biscuit eater! As the Million Pound Radio Show Pirate Sketch confirmed several years ago, pirates only speaks in the present tense does pirates, and any scurvy dogs found employing the past participle was either strung up from the yardarm, sent off for a training day in Eastbourne or thrown in the crèche! I was accompanied this time by my very good chum, author, illustrator and fellow pirate Vince ‘Silver Tooth’ Fry, “The Wencher of Crocodile Bay!” (aka Nick Ward). While ‘Silver Tooth’ worked with the lads and lassies reading extracts from Charlie Small’s journal ‘Pirate Galleon’ and then designing treasure maps, I picked up the subject of my previous portrait workshop to produce illustrations for some pirate themed ‘Wanted’ posters. I presented a couple of portraits by Leonardo and Rembrandt to the little landlubbers, and the distorted facial images produced by Modigliani and the portrait of Joshua Smith by William Dobell to ask the question, ‘When does distortion become caricature?’ I then showed grotesque caricature portraits by Leonardo, followed by work by Honoré Daumier, Gerald Scarfe and Ralph Steadman. The drawings produced were an adventurous development as a continuation of the previous formal session, and the collection of Pirate portraits produced today presented some pretty scary characters. A motley crew of Sea Dogs and Bucko’s if ever there was one. Blackbeard, Long John Silver, Captain Pugwash, Jack Sparrow and Johnny Kidd would have been proud of ’em! Avast ye, me Hearties! Another workshop, this time at the Fulbridge Academy working with children from year 3 & 4 thanks to an invitation from Rebecca Lockert. The first of two workshops having ‘Portrait’ as their theme, with this one presenting the subject formally and proportion being a priority. Next time we’ll be considering distortion, with the face as a caricature. I met with 3 groups of 30 children during the course of the day with each session following a similar format. Following some initial exercises to warm up I presented some images by Leonardo da Vinci to show the children his painting of the Mona Lisa, his portrait of a man in red chalk, his map of Imola, anatomical drawings and analytical drawings of the human form and head. 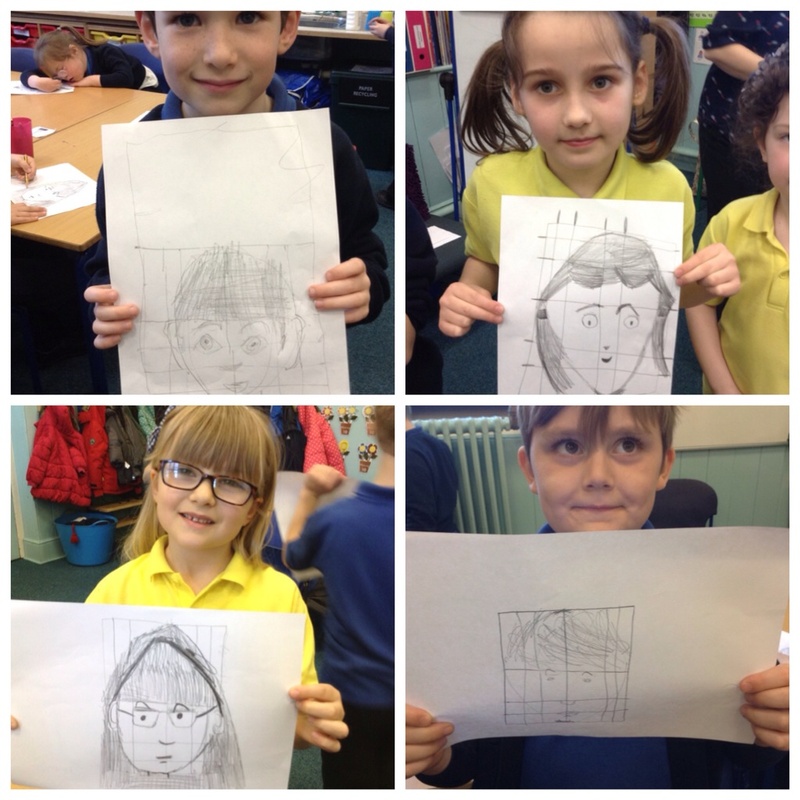 Using these last drawings as a starting point we then produced a drawing of a head by employing a grid. A second drawing was then produced which was much looser in structure but which used the same principles and some very lively and successful drawings were produced as a result. Why ‘All or Nothing’? It’s the Small Faces. A visit to the National Gallery, with notebook and pencil. A day spent learning from the Masters to improve concentration, the discipline of looking and the nerve of working in a public space. With drawing, there’s no hiding place.